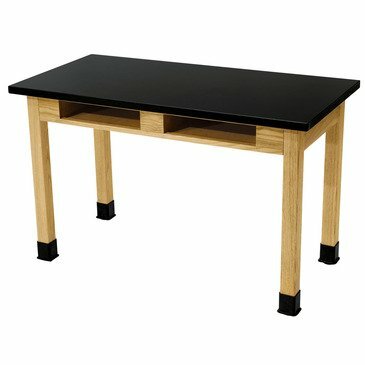 Built with solid 2-1/4 Inch thick ash legs and aprons that are attractively finished, these science lab tables are perfect for chemistry and biology classrooms. The tabletops provide an exceptional work surface and are made with chemical, acid, corrosion, moisture and stain resistant solid 3/4 Inch Phenolic Resin. All units feature a solid front. Legs are outfitted with rubber liquid-protecting boots and adjustable glides for accurate leveling.